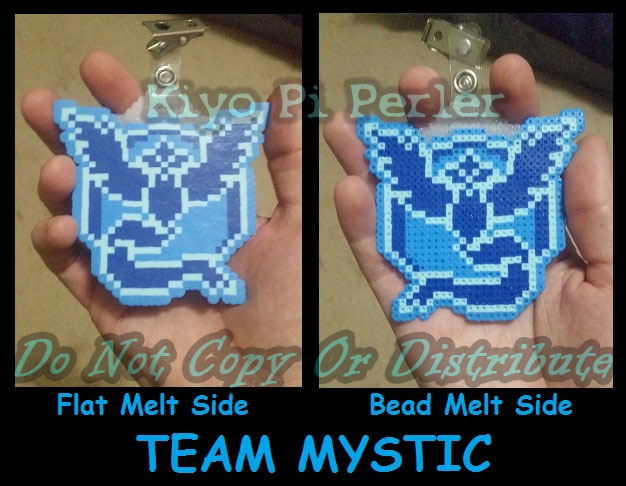 Team Mystic Badge (Original Pattern) - Finally was able to visit a Pokemon GO Gym and picked my team (honestly because Tora was already on the blue team and I liked the color lol). This is done in the mini-beads so it's nice and small and badge sized. (^__^) Wore it out tonight while we were hunting in my neighborhood. Of course everyone in our crew wants one now. X3 What have I gotten myself into. lol thanks Tora for the lovely pattern, my thinks it came out great with the 3 colors of blue that are offered in the mini-beads. Sidebar-bar; This is obviously NOT our original idea or concept, however the pixel pattern was created from scratch using the actual logo for reference. Please do not copy, reproduce, steal, distribute or otherwise sell this pattern. Thanks in advance for your cooperation. Original Characters: Are (c) by respective owners, please be respectful of original ownership of these characters.